London 16th November 2018 - Today sees the re-launch of Halo with £1.5m in investment and a reimagined production process delivering on its mission– togive people the world’s best coffees, in a way that’s best for the world, stemming the polluting tide of plastic and aluminium coffee capsules. 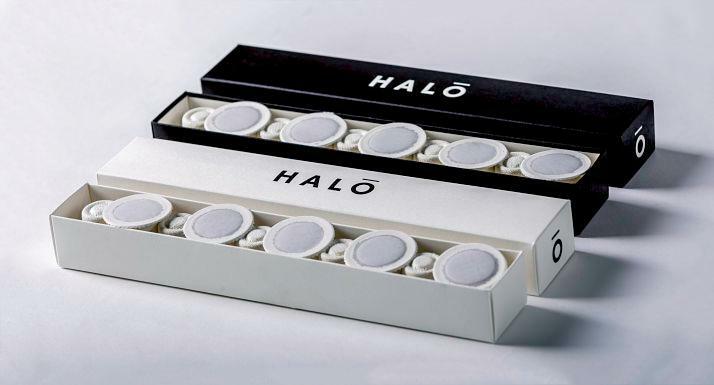 Halo launched to rapturous applause in 2017 and is the world’s first fully home compostable paper based coffee capsule filled with the finest, rarest and most desirable fresh coffee roasted and ground to perfection. Halo uses the best coffees in the world. Halo’s single origin Daterra Moonlight comes from the only plantation in the world with the top rainforest alliance certification. The Pacamara is a rare single origin from a Colombian plantation that produces world class coffees that are regularly used in competitions by the world's best baristas. Compatible with most leading home coffee machines, Halo is giving people the ultimate home coffee experience without compromising on taste, quality, convenience or planet. This time round Halo has used state of the art packaging that hasn’t been seen on the market before. The oxygen barrier wrap that keeps the coffee fresh – one of the most difficult elements with a fresh coffee in a capsule - is home compostable along with the Halo box, inserts and sticky label. Created by a world-class environmental design team, each Halo is made from a 100% natural blend of sugar cane and pulp paperthat can simply be thrown in the home food bin or home compost when it’s finished. Each capsule will break down, depending on the atmospheric conditions, in approximately four weeks. If a consumer’s council doesn’t provide food waste collection, Halo capsules can also go in the general waste bin and they will decompose quicker in landfill than any other type of capsule. After they degrade, they add nutrients such as nitrogen, phosphorus and potassium to the soil. With Halo capsules, coffee isn’t a contaminant. It's a vital part of the composting process. Aluminium or plastic capsules take up to 500 years to degrade. To expand the range Halo has added to its signature Three Mountain blend; Pacamara, a rare single origin from Colombia and Halo Minus, Halo’s first decaffeinated, naturally processed coffee from Ethiopia and Daterra Moonlight, a sweet and creamy Brazilian coffee. Halo has also partnered with the UK’s leading speciality coffee roaster, Masterroast where the coffee is roasted in one of the most energy efficient roasters in the world and ground in their state-of-the-art roller grinder giving the perfect extraction for our complex flavours. Buying Halo is just like buying a bag of freshly ground coffee but more convenient. Each Halo is cleverly engineered to keep the incredible coffee completely fresh, so Halo capsules smell and taste the way great freshly ground coffee should. And like fresh coffee, once opened they should be consumed within three weeks. Nils Leonard, Co-founder Halo said: “When people drink our coffee, they can drink it knowing it’s the best coffees in the world, in a way that’s best for the world – no compromise. We believe coffee manufacturers aren’t doing enough to remove the Asterix or small print because when that appears consumers’ need to know that recyclable often means washing out the coffee capsules before putting them in the recycle bin and compostable means industrially compostable which needs a special collection service. Confused – yes, simple – no. Our recent survey shows that over 50% of consumers don’t know the difference between biodegradable, home and industrial compostable and recyclable. It’s our job to educate them and stop this confusion so that they can make an informed choice about how they want to drink their coffee”.